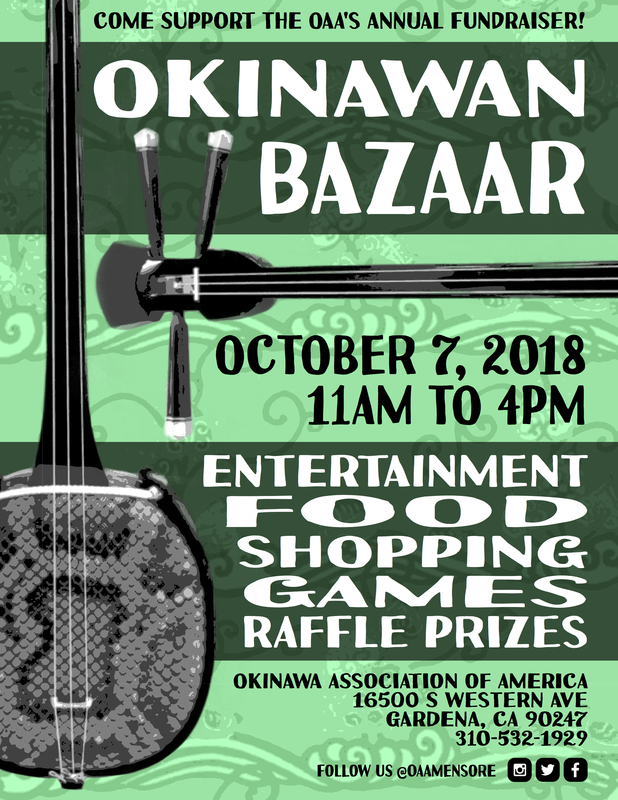 The Okinawa Association of America (OAA) will host their Annual Okinawa Bazaar on October 7 (Sunday), 11 AM - 4 PM, at the OAA Center in Gardena. This event is the organization’s largest annual fundraiser and is currently the only Okinawa-focused festival in Southern California. What started out as a small gathering of members has grown into an intergenerational cultural event that brings together hundreds of families for an afternoon of tasty food, soulful entertainment, fun games, raffle drawings (win Disneyland tickets! ), and more. 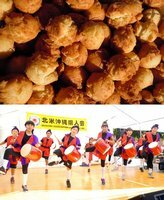 The food booths will feature a number of maasan (delicious) Okinawan foods such as saataa andaagii (“Okinawan dango”), Uchinaa suba (Okinawa soba), ashitibichi (pig’s feet), rafutee (Okinawa-style slow-cooked pork belly), ice cream made with beni-imo (Okinawan purple potato), and taco rice (a popular fusion dish in Okinawa). There will also be local festival staples like teriyaki bento, spam musubi, and shaved ice. The all-day entertainment program will showcase the traditional and contemporary performing arts of Okinawa (music, dance, and taiko), karate demonstrations, Hawai‘ian dance, and more. This year’s special guests include the cast members of “Letters to Eve,” an independently-produced musical that follows Japanese American families during World War II, and the energetic eisaa drumming students from El Marino Language School. For those who want to start their holiday kooimun (shopping) early, raffle tickets are available for $1 each with an extremely coveted grand prize: four Disneyland tickets ($400+ value; generously donated by the Walt Disney Company)! Merchandise booths will have souvenirs from Okinawa (limited supply), original Okinawa-themed merchandise (tote bags, t-shirts, and postcards), and fresh plants and produce. Local dance group Majikina Honryu Aigen no Kai will also sell handmade crafts and white elephant items. This event is a great opportunity to expose the younger generations to Okinawan culture while also enjoying a fun family outing. The warabi (children) tent will have a variety of carnival games like bean bag tic-tac-toe, ping pong ball toss, water balloon fishing, and a disk drop game. Prizes are given to all participants (while supplies last). There will also be a photo booth with an Okinawa-themed digital background. The Annual Okinawan Bazaar is organized by the Okinawa Association of America (OAA), a 501(c)(3) non-profit organization formed by Okinawan immigrants over 100 years ago. The organization has been kept alive by multiple generations of driven volunteers and generous donors. 2019 will mark the organization’s 110th anniversary as well as the OAA Center’s 20th anniversary. “We are blessed for the foresight of our elders had in creating a central gathering place for our organization and the surrounding community,” said Yuko Yamauchi, OAA’s Executive Director. The goal of this year’s fundraiser is to raise money for much needed repairs and renovations for the OAA Center’s facilities. While the OAA has only been at the current location for 20 years, the structures themselves are close to 100 years old. The 2018 OAA Bazaar would not be possible without support from generous sponsors. Individuals and companies interested in becoming a sponsor should contact the OAA as soon as possible for sponsorship tiers and benefits. josephkamiya . Atualizado em Set 25 2018 12:24 p.m.